Coleraine, a rural town in western Victoria, is on the Glenelg Highway 33 km north-west of Hamilton. An associate of the Hentys at Portland took up pastoral occupation of the Coleraine area in 1839. He was John Bryan and, although staying there for only a year, his name continued as Bryan’s Creek Crossing, Coleraine’s first name. The boundaries of several pastoral runs converged near the future site of Coleraine, and tracks from Portland and Hamilton met there. In 1845 the Koroite Inn (named after two of the pastoral runs) was opened, and a store was opened in 1848. Bryans Creek was surveyed as a township in 1853 and renamed Coleraine, after the township in Northern Ireland. The surveyor, Lindsay Clarke, was born in County Strabane, a short way west of Coleraine. A school was opened in 1855 in a town which was surrounded by large sheep grazing properties. The community went in for horse racing, holding the first race meeting in 1857 and the Coleraine steeplechase in 1858. Poet and rider, Adam Lindsay Gordon, competed four times, and there is a monument to him alongside the Glenelg Highway. An agricultural and pastoral society was formed in 1864. Anglican and Presbyterian churches were opened in 1866. After 1900 a number of pastoral estates were subdivided and a second group of subdivisions occurred in the 1920s. Some settlers were former members of the Indian Army, and successful farming was infrequent. Soldier settlement after World War II met with greater success. The post World War I period, however, witnessed the formation of amenities such as bituminised roads, reticulated water and a bush nursing hospital (1930). A Catholic primary school was put on a permanent footing in 1924 when two Sisters of St Joseph arrived; before then the school (1861) had opened and closed several times. Industries such as coal mining, sawmilling and brick making were short lived, and dairying was phased out. A world wide industry began in 1902 when Helena Rubinstein lived in Coleraine, with access to ample supplies of lanoline to manufacture her face creams. Coleraine’s population peaked in the 1960s while soldier-settlement and other farms obtained good wool prices. Between 1961 and 1991 the population fell by about one third. Wool and fat lambs have continued as the mainstay. Coleraine can be viewed from a hill to its south on which an arboretum has been planted. On the other side of the town is Bryans Creek and a large reserve, Queens Park. The showground and the golf course are west and east respectively, and the racecourse is further east. There are State and Catholic primary schools, Anglican, Catholic, Lutheran and Uniting churches, a community health service, a swimming pool, a recreation centre, a public hall, two hotels, a caravan park and a shopping area. The railway line closed in 1977. In 2014 Coleraine primary school had 49 pupils. 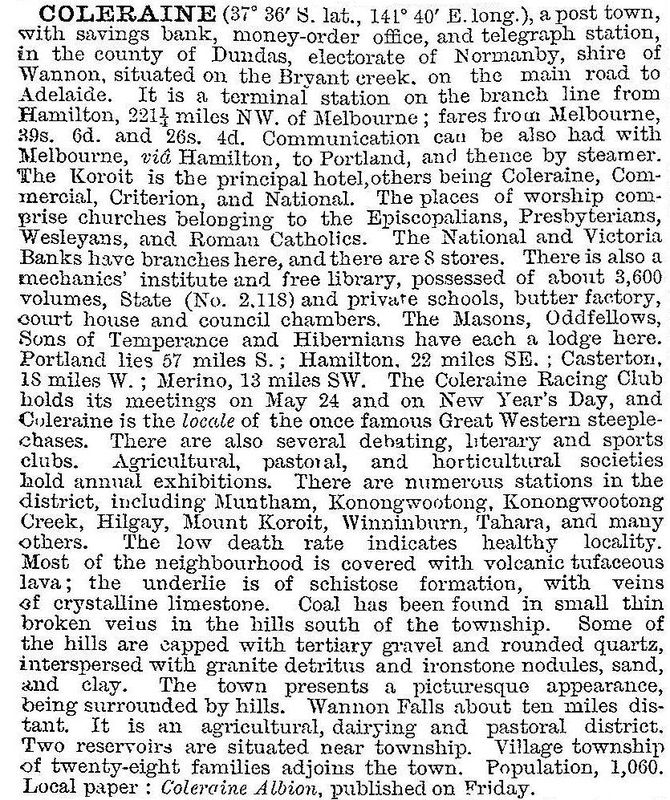 Coleraine is midway between Casterton and Hamilton, each about 30 km away. Coleraine's prosperity appears to have been reduced by their proximity. In 2013 several of Coleraine's shops were vacant or only half used. The difference was also reflected in Coleraine's lower house prices. The Avenue of Honour was replanted (2010) after it was destroyed on Black Saturday (2009). At the 2011 census the median age of residents was 54 years (Victoria, 37 years).